That East Region... Wow! UNC #1 overall seed but there are some capable teams lurking. Washington State (preseason top 10... battle tested in Pac 10) a 4. Butler a 7??? Wow, they play South Alabama in ALABAMA! Butler is a top 10 team. That is rediculous!!!! 2008-09 IU basketball motto: My Team Is On The Floor! Surprised Arizona State didn't make it. ArraySurprised Arizona State didn't make it. It really doens't matter though. IU's players have basically quit. EVERYONE (players, fans, future players, students, alumni, ect...) wanted McCallum to be coach, and when Greenspan gave Dakich the job after only being back for not even a full year, the intensity has dropped drastically. The only one who is still playing somewhat hard is DJ White... and that may only be because he is trying to become a 1st round pick... Anyway, he is still playing hard. Before the Penn State game last Sunday Bassett was 47% from 3 and has gone cold past 2 games. Eric Gordon is something like 10 of his last 58 from 3 (~17%). DJ White is the ONLY post player that can do anything for IU. He gets double teamed and then a guard does a 1 on 1 play and bricks a 3, or turns it over. And they now play little to no defense. IF IU gets past Arkansas (huge if), UNC would score 100+ easily. It is just frustrating because this team under Sampson was a legit top 10-15 team. On the bright side for me... At least IU drew a match that is Friday/Sunday. This means I won't have to skip one or two of my classes from 4:00-8:10 Thursday lol. I just realized that this is the first time since 1980 that neither of the title game participants from last year made it. I just tried the bracket simulation on espn.com... this is entirely simulated!!! There are some rumors floating around the internet that the selection committee switched IU and Oklahoma (6 and 8 seeds in the East) somehow with all the brackets that were made with all the scenarios for Georgia and or Illinois winning. I at first thought these people were just upset. Something just hit me though. 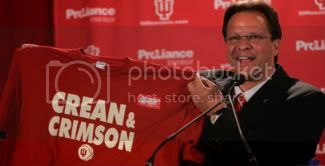 Well, IU played Coppin State in December. The committee is suppose to make sure it is impossible that 2 teams play each other before the sweet 16 if they played each other in the regular season. Yes it is a really LONG shot, but there is still a chance (probably .000000000000000000000000000000001% chance). However, even if there are 1,000,000 more zeros, it is still not mathematically 'impossible'.